The 2006 St. Petersburg Final Compliance Report reviews progress made on selected commitments set out at the 2006 St. Petersburg Summit for the period of July 20 to December 31, 2006. The preface and summary of the findings are listed below or can be downloaded here (for the whole report, see below). The press release and summary are also available available in German. The interpretive guidelines used to assess compliance on each commitment are also available. The commitments selected for analysis are available here. Contact information for interviews or questions here. Each year since 1996, the G8 Research Group has produced a compliance report on the progress made by the G8 member countries in meeting the commitments issued at each leaders' summit. Since 2002, the group has published an interim report, timed to assess progress at the transition between one country's year as host and the next, and then a final report issued just before the leaders meet at their annual summit. These reports, which monitor each country's efforts on a carefully chosen selection of the many commitments announced at the end of each summit, are offered to the general public and to policy makers, academics, civil society, the media and interested citizens around the world in an effort to make the work of the G8 more transparent and accessible, and to provide scientific data to enable meaningful analysis of this unique and informal institution. Compliance reports are available at the G8 Information Centre at <www.g8.utoronto.ca/compliance>. The University of Toronto's G8 Research Group has completed its eleventh annual G8 Summit Compliance Report, this year assessing the compliance of G8 countries with 20 representative commitments agreed to at the 2006 St. Petersburg Summit. Looking to all actions by G8 countries between 18 July 2006 and 15 May 2007, this report allows for an objective assessment of the St. Petersburg summit before the start of the upcoming G8 Summit in Heiligendamm, Germany from 6-8 June 2007. 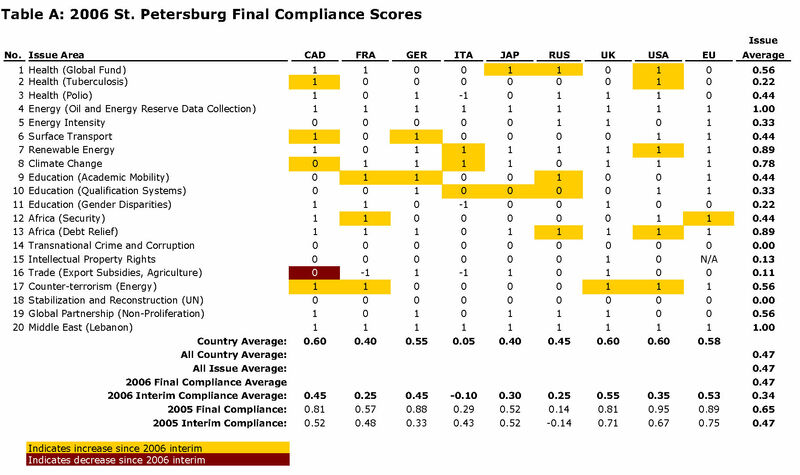 The final compliance scores are summarized in Table A, with individual analytic assessments by country and issue area in the sections below. This report spans 20 priority commitments, including three from the Summit's 'Fight Against Infectious Disease' theme (Global Fund, Tuberculosis, Polio), three from the Summit's 'Education for Innovative Society in the 21st century' theme (Academic Mobility, Education Qualification Systems, Gender Disparities), and five from the Summit's 'Global Energy Security' theme (Oil and Energy Reserve Data Collections, Energy Intensity, Surface Transport, Renewable Energy, Climate Change). Each analyzed commitment is surveyed across all G8 countries plus the European Union (EU). The final compliance scores reveal that during the compliance period from 18 July 2006 to 15 May 2007, the average compliance score across all issue areas and G8 countries was 47% (see Table A). This average is based on a scale whereby 100% is equivalent to perfect compliance and -100% means that the member governments are either non-compliant or are, in fact, doing the opposite of what was committed to. A score of "0%" suggests a work in progress, whereby a commitment has been initiated, but not yet completed within the one year time frame. The final compliance score is up modestly from the interim compliance score of 35%, assessing compliance as of 31 December 2006 at the time of the transfer of the G8 presidency from Germany to Russia. This final compliance score of 47% is significantly lower than recent summits, and is a 28 percent decline from the 65% registered for the Gleneagles summit (2005). 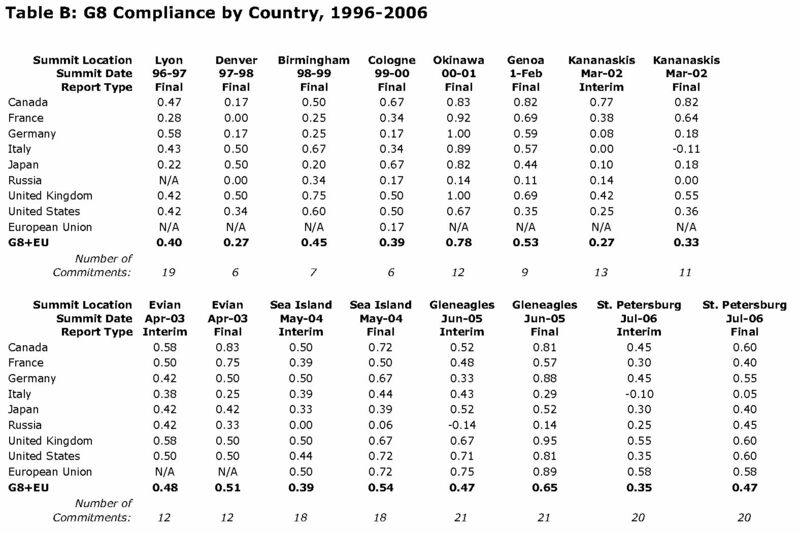 It is also the lowest final compliance score since the 33% registered for the Kananaskis Sumit (2002). While it is thus also substantially lower than the 54% compliance at Sea Island (2005) and 51% compliance at Evian (2004), it also falls below the 48% average final compliance score for all summits since the G8RG began undertaking compliance studies at the Lyons Summit (1996). Canada, United States and the United Kingdom set the compliance standard across all 20 commitments each with a score of 60%. While for Canada and the United Kingdom, this reflects historical high levels of compliance, for the United States it confirms a recent trend of increased compliance with G8 commitments. Similarly, the EU continues its historical levels of high compliance by placing a close fourth, with a compliance score of 58%. The EU had been at the head of the compliance pack in both the Gleneagles and Sea Island summit periods with exceptional compliance scores. Germany, which assumed the G8 presidency in January 2007, follows in the fifth position at 55% compliance, a modest decline from its historical compliance high in the Gleneagles compliance period where it placed third. In the next tier of compliance, Russia registers a record 45% compliance, for a placement of sixth place. Russia had lagged other G8 members during all previous compliance periods, attaining a rank of no higher than eighth. This year, it sees a meteoric rise from its benchmark compliance scores of 0% at Kananaskis (2002) and Sea Island (2004). 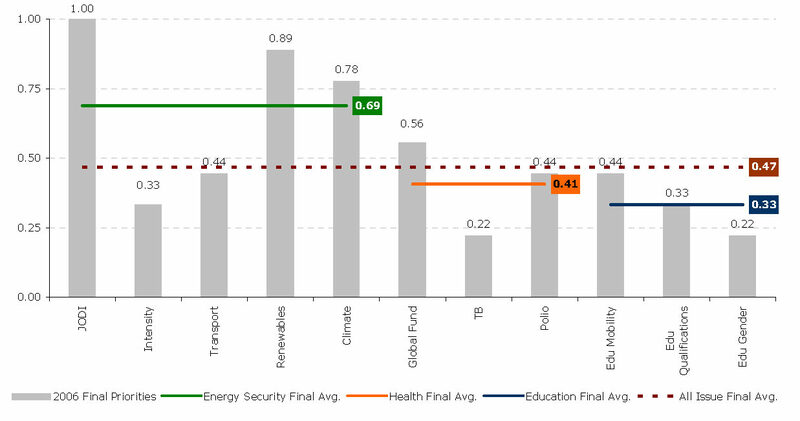 Following close behind, France and Japan tie for seventh place with each achieving a compliance score of 40%. For France, the arc of high compliance that began with Okinawa (2000) and lasted through to Evian (2003) has definitely dissipated as, for the third consecutive summit, it lags behind the compliance pack. For Japan, this continues recent levels of low compliance. Italy registers exceptionally depressed compliance, well behind all of its G8 peers, recording 5% compliance and reaffirming its historical record of poor G8 compliance. No G8 country scores in the negative range for its compliance score. Nothwistanding some of these relatively low compliance levels, the United States, Russia and Germany are all outperforming their historical compliance averages, as is evident from the figure below that displays G8 compliance against both 2006 averages (dashed lines), and each country's historical compliance averages since 1996 (triangles and squares). Conversely, both Italy and the EU are significantly underperforming historical averages. Still, for seven of the eight G8 member countries, as well as the European Union, the final compliance score is down relative to their compliance score at this point during the Gleneagles compliance period. These declines range in scope from a 19% decline for Italy to an 8% decline for Japan. This includes the EU and the United States, that despite their historical overperformance, have compliance scores 17% and 18% lower respectively than they registered at Gleneagles. By contrast, Russia records a 27% increase in compliance relative to its final compliance score for Gleneagles, emphasizing the short-term and long-term character of its increase. Since the G8RG also produces an interim compliance report that assesses compliance with St. Petersburg commitments from the summit through to 31 December 2006, it is possible to evaluate general trends in compliance over the course of the St. Petersburg compliance period. Overall, compliance scores increased in 10 of the 20 commitment areas. At on extreme, the European Union, Germany, Canada and the United Kingdom all exhibited particularly front-loaded compliance patterns, with their compliance scores changing relatively little since December 2006. For Germany, a leader in compliance at the interim period, this has shifted it back to the upper middle of the compliance pack. For Canada, this is an unusual pattern; historically, Canadian compliance has tended to be very concentrated in the second half of the compliance period. Russia and the United States, and to a lesser degree France, on the other hand, all have shown significant evidence of compliance score improvement since the interim compliance report. After reaching 0.75 for the Gleneagles Compliance period, the compliance gap between member countries decreased somewhat to 0.55 (60% for the UK, USA and Canada compared to 5% for Italy). This compliance gap is similar to the compliance gap of 0.58 at Evian (2003), modestly lower than the 0.66 of Sea Island (2004) and significantly less than the record 0.93 at Kananaskis (2002). Removing Italy, the gap between first place (60%) and 7th place Japan and France (30%) is only 0.30. Compliance by issue area varies considerably across the commitments considered. Of the 20 priority issues assessed, only the Oil and Energy Reserve Data (JODI) commitment and the Middle East/Lebanon commitment that called for the provision of economic and humanitarian support to the Lebanese people achieved perfect compliance scores of 100%. Here, perfect compliance reflects unanimous efforts to enhance the collecting and reporting of market data on oil and other energy sources, and alternatively, sufficient and substantial economic and humanitarian support for Lebanon. Six other commitments attain scores above 50% compliance. A commitment to facilitate the development of renewable energy in developing countries attained a score of 89%, as did the G8 commitment to debt relief. Close behind, a commitment reaffirming the G8's Gleneagles commitments on climate change follows in fifth place with a score of 78%. Finally, three commitments record scores of 56%: first, a commitment to securing global critical energy infrastructure from terrorist attack, second, a commitment supporting the Global Partnership against non-proliferation, and third, a commitment supporting the Global Fund. Four commitments achieved the median compliance score, 44%: a commitment to pursue the eradication of polio; a commitment to increase academic mobility between G8 countries; a commitment to continue supporting the creation of an African Standby Force; and finally, a commitment to pursue alternative and cleaner forms of surface transportation. Another duo of commitments witnessed a below-median 33% compliance. These relate to consideration of energy-intensity targets and exchange of information about education qualification systems. At 22% compliance come commitments that support the elimination of gender disparities in education in the developing world and support fot the Global Plan to support TB. A commitment to reduce trade-distorting agricultural subsidies follows closely at 11%. Finally, two commitments score 0% compliance: first, one relating to support for UN reforms for more efficient peacekeeping operations, and a second committing to combat transnational crime and corruption. No commitments scored in the negative range. The Russian government identified three thematic priorities for the St. Petersburg summit: energy security, infectious diseases, and education. Compliance in these issue areas varied. Five representative commitments were drawn from the energy security summit document. These had an average compliance score of 69%, substantially higher than the overall interim compliance average of 47% but approximately at historical averages for these issue areas. Compliance with the infectious disease and education commitments were more depressed, with the G8 registering average compliance scores of 33% and 41%, respectively. This compliance level was below the 2006 St. Petersburg final compliance average of 47%, and also below historical compliance levels in health and education commitments since 1996. The average score by issue is the average of all countries' compliance scores for that issue. The average score by country is the average of all issue scores for a given country. The overall compliance average is an average of the overall issue average and overall country average. N/A represents scores where either a commitment is considered irrelevant to a particular party or insufficient data has been gathered to make an assessment of compliance with a commitment; such scores are excluded from the average. Commitments were selected from a total set of 317 commitments identified in Summit documents and communiqués. Full list of commitments available at www.g8.utoronto.ca/evaluations/G8_commitments.pdf. We will work with other donors and stakeholders in the effort to secure funds needed for the 2006-2007 replenishment period and call upon all concerned to participate actively in the development of a four-year strategy, aimed at building a solid foundation for the activities of the Fund in the years ahead. "We will also support the Global Plan to Stop TB, 2006-2015, which aims to cut TB deaths in half by the year 2015 compared to 1990 levels, saving some 14 million lives over ten years, and call upon all donors and stakeholders to contribute to its effective implementation." "We urgently call for mobilization of financial support and will continue to work collectively and with bilateral and multilateral donors to close the funding gap for 2007-2008, and will continue to work with others towards securing the resources necessary to finish the program and declare our planet polio-free in the near future." "We welcome the beginning of implementation of the Joint Oil Data Initiative (JODI) and will take further action to improve and enhance the collection and reporting of market data on oil and other energy sources by all countries including through development of a global common standard for reporting oil and other energy reserves." "We will facilitate development of local energy resources, including those based on core generation technologies and on renewable energy, such as hydropower, wind power, geothermal power, biomass, and the effective use of solar energy, to contribute to poverty reduction and long-term energy sustainability in developing countries." "We reaffirm our intention to deliver on commitments made in Gleneagles in order to meet our shared and multiple objectives of reducing greenhouse gas emissions, improving the global environment, enhancing energy security and cutting air pollution in conjunction with our vigorous efforts to reduce poverty." "We will promote international academic mobility at all levels, significantly increasing the mobility of students, teachers and researchers." "We will share information about qualification systems in our countries to increase understanding of national academic practices and traditions.."
"We regret that interim targets related to eliminating gender disparities in primary and secondary education have not been achieved. Greater concerted action by all will be needed to fulfill these key goals by 2015. We reaffirm our commitments in this regard." "continuing, in cooperation with the EU, UN and other partners, to assist the AU and African sub-regional organisations in further developing the African Standby Force including transportation and logistics support arrangements"
"ensuring the full implementation and financing of the Multilateral Debt Relief Initiative (MDRI) according to our commitments made at Gleneagles and on a fair burden-share basis, and preserving long-term debt sustainability through the implementation of the IMF/World Bank debt sustainability framework for low-income countries;"
"We maintained our commitment to implement and promote the FATF recommendations, the UN Convention on Transnational Organized Crime, and the UN Convention Against Corruption. We note the critical contribution of non-governmental organizations in the fight against corruption.."
"In agriculture, we are equally committed to substantially reducing trade-distorting domestic support and to the parallel elimination by the end of 2013 of all forms of export subsidies, as well as the establishment of effective disciplines on all export measures with equivalent effect, as agreed in Hong Kong.."
"We announce a plan of action to secure global critical energy infrastructure, including defining and ranking vulnerabilities of critical energy infrastructure sites, assessing emerging and potential risks of terrorist attacks, and developing best practices for effective security across all energy sectors within our countries." "In order to facilitate the UN's rapid and efficient response to crises, G8 states commit to pursuing reforms in the United Nations to ensure that resources are available in advance to the UN as it works to establish new peacekeeping and peace support operations pre-positioning equipment in Brindisi, an increase in pre-authorization funds to support DPKO's planning, and the authority to identify personnel in advance of a UNSC resolution mandating a new PKO;"
"We remain committed to our pledges in Kananaskis to raise up to $20 billion through 2012 for the Global Partnership, initially in Russia, to support projects to address priority areas identified in Kananaskis and to continue to turn these pledges into concrete actions. "We will support the economic and humanitarian needs of the Lebanese people, including the convening at the right time of a donors conference."